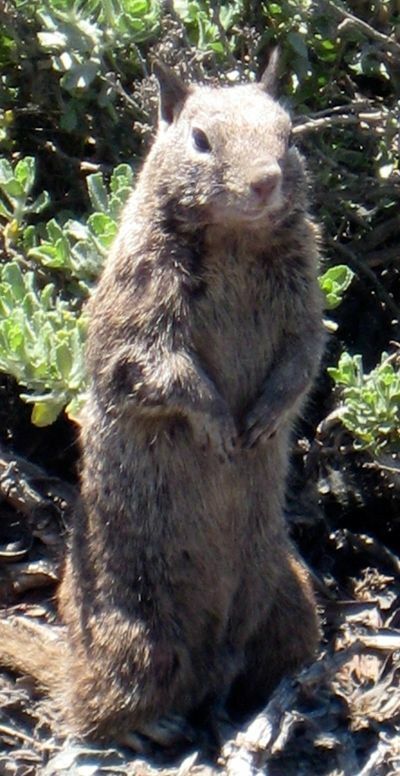 The California Ground Squirrel, Otospermophilus beecheyi, can be found all over the western U.S. in places such as California, Oregon, and Nevada. They live in holes in the ground, which are sometimes communal, and they never venture far from their homes. They are gray and brown with white highlights around their eyes. I have heard stories of people taming California squirrels and carrying them around in their front shirt pocket while feeding them peanuts to keep them entertained, but I highly recommend against this as some squirrels may carry tetanus or bubonic plague.